Remember this book about rooftop gardens? Well, a NYC based photographer Stéphanie de Rougé shot a fantastic series called "On your Roof" where she shows an intimate, soothing and almost poetic side of those often hostile urban spaces. She wanted to show where random people hide their secrets and she found that often the rooftop is the most intimate place of all. Aren't those photos breathtaking? Wish we could climb on our roof sometimes with a bottle of wine and spend the evening looking at the twinkling lights! P.P.S: Here is the whole series. Both me and the Mr went 'hmm' at the thought og having a garden. Therefor we decided to buy a large apartment instead with a huge balcony to lounge on. It's heaven! wowwww!!! A friend of mine has a swimming pool in her roof, and is the best think ever! specially for now that is very hot in Barcelona!! I love this selection! Oh yes, great photos. I love the one with the jacuzzi. I love rooftops! I'd love to ride my bike up there! Have a great day! kisses. I would love to have my own rooftop, I think I would plant myself a little garden :) too cute! i'd sooo love to have a roof terrace! or a hot tub on a roof, even better! How much do I wish I had a rooftop space?! I love the one with the hot tub on the roof...how awesome is that! And the one with the photographer taking a photo...amazing pictures! Hope you have a great day love! Seriously how cool would it be to have a hot tub on your roof?! Monica, me too! I think it would be so brilliant to ride a bike on a roof! The view would be amazing from there! That would be totally awesome, Vanessa!!! 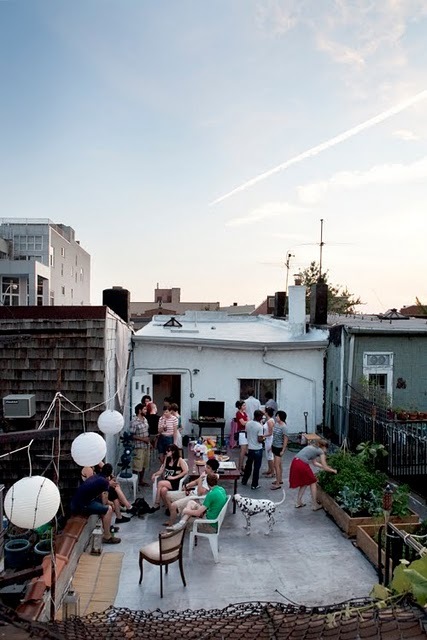 I have been( and planned) some of the most fabulous roof parties in NYC-nothing beats it! How great would this be! Would love to experience that! great little hideouts...with a view!...wonderful things must happen on rooftops! I love a good rooftop party! Looks so relaxing, especially the guy on the bike. Great series! these photos are amazing. I would love a hot tub in my roof, or maybe just enough space for a picnic rug so I can sit under the stars! I would love to have a rooftop to have intimate dinner parties and a quiet place to watch the world go by. so fun!! what a perfect spot for a party. Love the pics! We share a rooftop at our building, but it's been closed for the last couple months. Hopefully they will reopen it soon! At least we still have our balcony! I'd love to have a roof top garden and patio. We stayed at a hotel across from the UN a while ago and we were high enough up to be able to look down on everyone's roof top spaces...it was so relaxing to see others relaxing on their roofs in NYC! We used to party on roof tops back home, it was so much fun. Ah! Totally makes me think of summer :). LOOOOOOVE. Wow, these picture are genius! I have a friend who's roof you can climb out on! All houses should be built with that feature! I will live on roof #2 please. How totally gorgeous. What wonderful pictures and views!! i always dream of living in a place with an awesome rooftop + view. :-) i rather have a rooftop than a front lawn. or maybe even a backyard. The movie screen is my fave!! Wow, this post is soo cool. I wish I had a rooftop like that here in San Francisco. You have a really nice blog, the hot tub on the roof is so cool and the guy riding his bike. Oh my!! So dreamy! and perfect!!! And I thought the best thing is to have a big yard! A large roof is even better!!! I lOVE this. The hot tub shot is my favorite for sure. I love that they are all wearing fun hats and relaxing. Great views. Looks like a fabulous book..